I have spent 9+ hours with GoDaddy, both in online support chat and in a 2.5 hour phone conversation, plus a lot of time online in cPanel, file manager, etc. trying to get 3 simple things done. brucecoville.com is currently hosted on another service provider – we want to move the domain to GoDaddy and build a new website there. Currently, the new website is under development under dev.brucecoville.com in a subdirectory of unicornchronicles.com, because that domain was already on a cPanel server, so I was instructed to build the site in a subdomain there and then move it to its own domain (brucecoville.com) when it is ready. The client (Bruce Coville) paid for the migration, and a couple days later, we received an email stating that it had been completed. “You will need to remove fullcastaudio.com from your original hosting account and rename new.fullcastaudio.com to fullcastaudio.com. At this point, DNS for the domain/subdomain can be pointed over to your new IP address. The easiest method is to update your current DNS zone files A records for fullcastaudio.com address to point to 160.153.58.135. If you choose, you can also create your own nameservers to point your entire domain’s DNS zone file too. Due to the way that WordPress works, we have placed the following entry into your wp-config.php file for previewing purposes. Please remove the aforementioned entry when you are finalizing the site move in order to ensure that visitors are not sent to the subdomain used for previewing. PLEASE NOTE: Failure to update DNS may result in viewers viewing the old website with old content. If you do not move DNS and continue to make changes to your website, these change will not carry over to your new service. Seriously? That’s not a finished migration. I completed those steps, or thought I had, and ended up with a 404 error when trying to load the site (fullcastaudio.com). I have since reset the DNS and name servers so the old site loads, until I can get this worked out. In the meantime, Bruce Coville has been billed for another term of Windows Hosting, when that hosting should have been discontinued with the migration. I need to get this resolved. 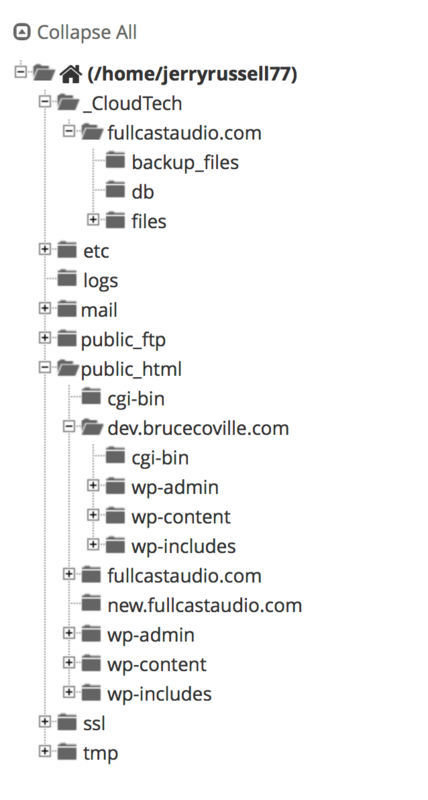 ALL 3 DOMAINS — fullcastaudio.com, brucecoville.com and unicornchronicles.com should reside on cPanel. • fullcastaudio.com website is complete and just needs to be successfully migrated to cPanel. 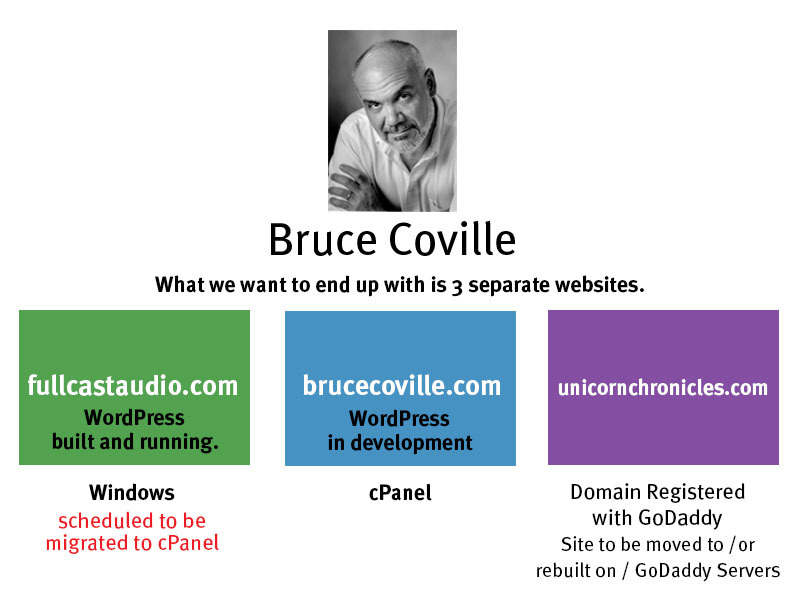 • brucecoville.com website is under development and will need to load correctly when the name servers and DNS and the config file and whatever else are updated. AT LEFT: This is the listing in the File Manager for “unicornchronicles.com” I don’t understand why there are 2 directories for fullcastaudio.com and one for new.fullcastaudio.com, or why they need to reside inside the unicornchronicles domain. Go to the top of this page and look at the graphic. Subsequent chat, on 11/14/17 where the migration was completed. After that, another 1/2 hour session because the Catalog page was broken after the migration. Tech support traced it to a PHP setting that needed to be updated (from 5.4 to 5.6). I made the update while tech support guided me through the steps.